The reaction to Jeremy Corbyn’s dramatic last-minute feat in getting on the Labour leadership ballot from some sections of the party has been predictably vicious. Familiar MPs, commentators and grandees stepped forward with a chorus of spite claiming that Corbyn’s inclusion represented a reckless concession to left-wing ‘extremists’ and showed that ‘the lunatic wing of the party is in control’. However, one particular charge against Corbyn stood out for its sheer calumny, which was that Jeremy is an associate of, and perhaps even apologist for, anti-semites and friends of ISIS as a result of his longstanding support for the cause of the Palestinians. This accusation was the most comprehensively expressed by an open letter published on Left Foot Forward penned by Alan Johnson of BICOM (Britain Israel Communications and Research Centre). Johnson’s accusations rest on two key pillars; firstly the disingenuous recycling of distorted and misleading allegations against Raed Salah which first emerged during his deportation case in 2011, at which time Corbyn was a key defender of Salah; and secondly the all too common view that anybody who supports dialogue and diplomacy with Hamas and Hezbollah must necessarily wholly endorse their politics as well. The latter pillar is a simple enough matter. Jeremy Corbyn was ahead of his time in recognising the need to talk to Sinn Fein and the IRA in 1984 when he invited Gerry Adams to London, and the same is true in relation to Hamas and Hezbollah. This farsighted act was subject to a furious barrage of criticism at the time, and yet now over 30 years later the importance of such acts of dialogue and goodwill in bringing an end to the Troubles could hardly be more uncontroversial. The violent and often racist nature of Hamas and Hezbollah’s role in the region’s conflict apparently make their invitation to parliament unconscionable, whereas representatives of the (just as) violent and often (just as) racist Israeli state can be invited without so much as anyone batting an eyelid. Many of Johnson’s criticisms are legitimate, but horribly blinkered regarding the wider context. For example, Johnson is right to criticise the content of the 1988 Hamas Charter and no doubt there are significant elements of Hamas’ political support and leadership that subscribe to grotesquely anti-semitic, anti-feminist and anti-gay views no matter how much some in Hamas now try to distance themselves from it. However, Hamas’ deep roots and enduring popularity among the population (particularly in Gaza) stem from something other than simple Jew-hating. Hamas’ function as the largest and best-organised part of Gaza’s armed resistance against Israel is far more relevant to most Palestinians, and it’s designation by some (but not all) western governments as a terrorist organisation which cannot be negotiated with rather than the legitimate (albeit reactionary) representative of a desperate oppressed people is a crude act which massively hinders efforts towards peace. 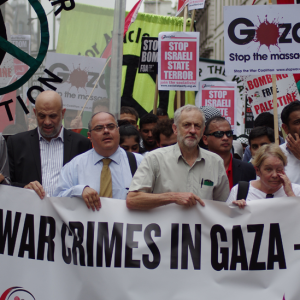 Once able to see past the rigid black and white dogma of the dominant neo-conservative discourse towards Israel-Palestine, Corbyn’s position can be seen for what it is: realist, oriented towards peace and justice, and necessary. But what of Raed Salah, a man described by Johnson as a ‘vicious anti-semitic Islamist’? Salah was the subject of a legal battle following his arrest and attempted deportation in 2011 by Theresa May on grounds of hate-speech and repeating the blood libel. In his letter Johnson sites multiple pieces of evidence that were included in an immigration tribunal ruling supporting May’s decision to ban Salah from the UK. What Johnson conveniently omits to mention is that Salah successfully appealed that decision after the appeal court found that key pieces of evidence had been mistranslated and/or selectively presented to the extent to which the Home Secretary had been ‘misled as to the terms … written by the appellant, a matter on which there is now no room for dispute’. Given the nature of BICOM’s work, Johnson can hardly claim to have been ignorant of these facts, and it is hard to escape the conclusion that his presentation of the tribunal’s initial decision as definitive is deliberately misleading. However, doctored evidence aside it should be stressed that just as with Hamas and Hezbollah, Salah holds views that are diametrically opposed to Jeremy Corbyn’s. Corbyn is socialist and the others are not, Corbyn is secularist and the others are not, Corbyn is a steadfast defender of LGBT rights and the others are certainly not. Corbyn also understands that peace can only be achieved through mutual respect and diplomacy. If only the likes of Alan Johnson felt the same maybe the international community would have made progress in tackling the endless cycle of air-strikes, rocket attacks, war crimes and kidnappings that feed violence and extremism in Israel and Palestine. BICOM’s Alan Johnson appears to have undergone highly successful operation to remove his sense of decensy. 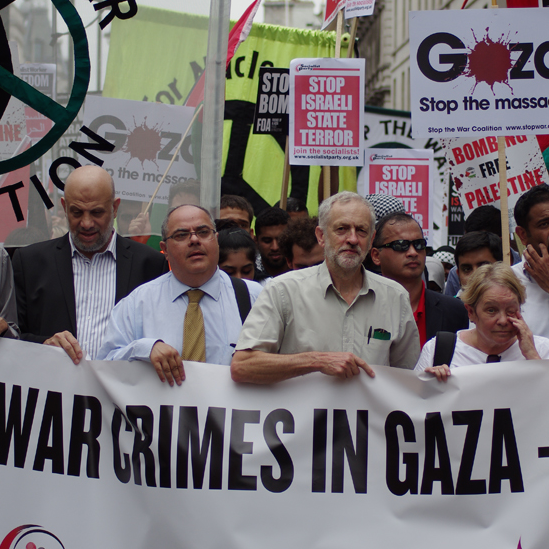 Israel/Palestine is one if those issues: As a friend of Israel, I am lined up alongside Netanyahu, American neoconservatives, and David Cameron…whereas Jeremy Corbyn is lined up alongside Hamas, Islamic Jihad, Raed Salah and Hezbollah! All I know for sure is that socialism and social democracy is the only long term and just solution for all in Israel and Palestine. I equate that kind of attack in the same way as the Euro Leaders are attacking Syriza, desperation. When people say, oh he’s a nice man, I firstly think that’s good, but then allow time to make judgments for myself, Jeremy; as I don’t know him personally, has been consistent and forthright the longer time has gone on, I really can’t say the same for a lot of the other MPs. What does make me annoyed though is I find Alan Johnson pedestrian and lacking real conviction, whilst wasting hours of television coverage where he could bring real issues to life in peoples minds. The sad fact is though that that is precisely why he is invited on to the shows. It should be pointed out that the Alan Johnson of BICOM referred to in the article is not the same as the better known Labour politician Alan Johnson. The irony is that the Israeli state helped to sponsor Hamas as a way to split the Palestinians on religious and political grounds and thus undermine their resistance to Israel’s actions. Alan ‘Not the Minister’ Johnson might wish to think on that. Nobody who supports the Palestinian National Democratic Revolution can have any truck with the Ghetto Gangsters of Hamas or the Bantustan Bosses of the West Bank because they represent the forces in Palestinian society against whom such a revolution would, without the intervention of imperialism and Zionism, have been originally primarily directed. Anybody who is a friend of Hamas or Fatah is a friend of Zionism and the two-state lie and an enemy of democracy. The biggest obstacle to victory for the Palestinian cause at the moment is Fatah and Hamas and we won’t even begin to talk about the fascist ISIS thugs. The Spinwatch piece on BICOM is worth reading; it’s amusing how supposedly left-wing ‘Friends of Israel’ end up with the Zionist right. The report is here. calumny – the making of false and defamatory statements about someone in order to damage their reputation; slander. I’m not aware of anyone accusing Jeremy Corbyn of being an “associate” of or “apologist” for “friends of Isis”. I’ve looked but couldn’t find any evidence so a link would be in order. As for Corbyn being an “associate” of anti-semites. Well, he is! It is not a “calumny” to say that, it’s a fact which you even repeat in your article. Corbyn described Hamas as his “friends” as you well know. This goes beyond calling for peace, justice and negotiation in Israel/Palestine (with which I agree) but taking the side of Hamas. You write “no doubt there are significant elements of Hamas’ political support and leadership that subscribe to grotesquely anti-semitic, anti-feminist and anti-gay views”. Some? The anti-semitism is in their Charter. Has Corbyn ever publicly criticised the views of his “friends”. Not that I’m aware of. Corbyn represents the the Far Left anti-Zionist “Destroy Israel Now!” tendency. He believes that Palestine has been “occupied for 60 years” (Guardian March 2011). His is not the voice of reason and peace in the area, rather that of uncritically supporting those who wish to destroy Israel. If you believe this to be a “calumny”, show me anywhere Corbyn has been critical of his anti-semitic friends in Hamas. If the same words had been uttered by, for example, someone on the English far right, I’m sure you’d expect immediate and unambiguous condemnation of them. It should be no different in the case of Raed Salah.